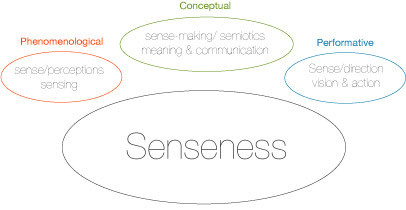 Senseness is a concept that was coined during my MA studies in Design futures at Goldsmiths, University of London in 2004. Senseness emerged from an awareness of the power of creativity and the need for treading more lightly and carefully in a world moving rapidly toward unrestrained materialism. How do we balance the paradox of continuously needing to create and produce artifacts and experiences in our current paradigm and what are the aesthetic responses we are elicting? Senseness is a concept that is growing and seeking its forms and manifestations. Yet it is first of all an approach to working with art & design. It informs several levels of thinking, sensing, and acting and is a perceptual approach. This means being sensitive both to the relational (connections) and contextual (time and place) aspects of a creative process and its outcome. Heidegger talks about the “action of bringing-forth” which is perhaps how Senseness arises – as a catalyser – revealing potentials and intentions, bridging gaps between content and form, sense-making and creating new meanings that all at some point i hope are enacted and perhaps even can be described as “aesthetic activism”? This blog is a first attempt to launch the concept beyond its current context, and to start to explore some manifestations… its a process and your comments and thoughts are welcomed to help expand the boundaries as well as test its limits. Senseness by Anette Lundebye is licensed under a Creative Commons Attribution-Noncommercial-No Derivative Works 2.0 UK: England & Wales License. It’s wonderful to see your concept in action, – may this process be inspirational for many many people and may it enrich and nuance your own project.